Pop quiz, hotshot: You’ve got 30 minutes, 10 bucks and a hearty appetite. What do you do? Visit one of these speedy spots and grab a cheap and tasty bite on the fly. This network of clever quick-stops cooks its ultra-healthy burritos using steam only, which it says locks in nutrients, flavour and moisture, and prevents shrinkage (their word). Peel back the foil and scarf your Steamroller on your way back to the office. $5.25-$9.75. Multiple locations. Sciué (shoe-eh) means “good and fast,” a description that applies to the service and the Roman street fare offered at this Italian eatery. There are a dozen kinds of paninotecas featuring fine cheeses, meats and Mediterranean veggies. Add a side salad and still keep it under $10. Paninis, $7.50 – $8.50. 110-800 Pender St., 604-602-7263; 126 Davie St., 604-689-7263. 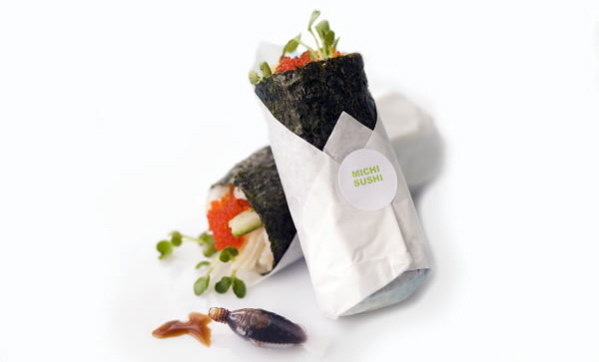 The handy handrolls (pictured above) at this sushi stopover are specifically designed for devouring on the go. Individually wrapped, you can dribble soy sauce down the middle and skip the chopsticks. Three for $8. 1513 West Broadway, 604-736-4244. This tasty take on the classic burger shack serves up deluxe varieties like the Cattleman’s Special with provolone and bacon. Order ahead online to save time. From $5.29. Multiple locations. This pair of Lebanese nooks folds up pleasing pitas, and the garlic quotient will surely speed along your afternoon meetings. Of the dozen-plus varieties, the Najib (crispy cauliflower) and Lamb Kafta keep us coming back. $5.50 – $10. 207 West Hastings St., 604-688-1655; 1206 Seymour St., 778-371-3266.